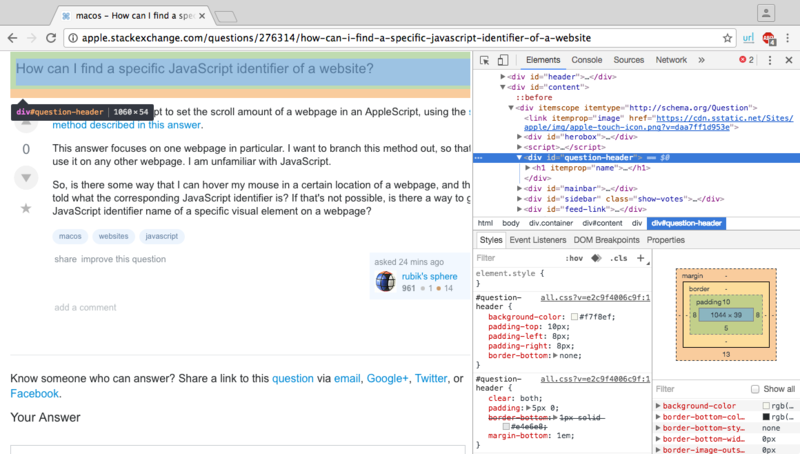 As an example in Google Chrome, using the URL of this question and setting the scroll to point to the question header of the page, use Chrome > View > Developer > Developer Tools ⌥⌘I to find the id. In this case it's called question-header. You can also right-click and select Inspect from the context menu, which will bring up Developer Tools directly to that point in the code. The following code will open this page and scroll to the question header. -- scroll to the top of the question header. You can also get a quick list of the <div id= anchor points using curl in Terminal and piping the output to grep, as in the example for this page. Note: While curl will bring the page down, the grep command as shown in the example may not work as nice as it did for this page. Some page content doesn't have line breaks and the code is a contiguous stream. How to change scrollbar position in AppleScript? Can an application be auto-raised only if no other applications are focused?